In September 2001, I got a call from John Skinner, a local music contractor. 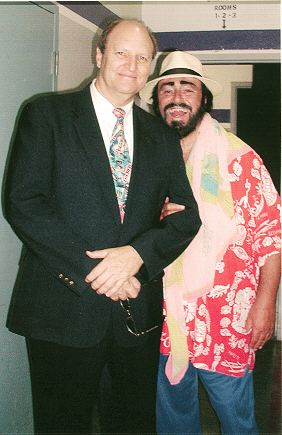 He told me that the legendary operatic tenor, Luciano Pavarotti, was coming to Sacramento for a “one night only” concert. He asked if I would be able to join the orchestra and accompany Mr. Pavarotti on a couple of Italian folk songs. Needless to say, I jumped at the chance to play with the finest tenor opera singer of the 20th century. Sitting on stage next to that beautiful and powerful voice was a thrill. After each song, he’d raise his arms with his white handkerchief in hand and flashbulbs would go off in a blinding frenzy. It reminded me of a Beatles concert (except here they all went off at the same time). It happened every time he finished a piece. As memorable as the concert was, the rehearsal earlier that day was actually the highlight and peak experience. Pavarotti’s conductor had already rehearsed the orchestra for a couple of hours and we thought the rehearsal was nearly over. All of the sudden, in walks Pavarotti. What a sight! Beaming royal blue trousers, white Fedora, a gigantic pink and turquoise scarf draped over a red and white kimono shirt, topped off with bright colored tennis shoes. All this, coupled with his jet black beard and there was no mistaking it. He had the aura of a super star, which he was. Once again, the orchestra started playing through the material. This time with Pavarotti’s booming voice soaring above us all. Suddenly, he abruptly stopped everything. He was not happy with what he was hearing and proceeded to explain the emotion of the song and described the scene in the opera. Next, and most importantly, he would vocalize the orchestra parts. Hearing him sing, you could grasp the nuances, phrasing and dynamics very quickly. When the conductor led the orchestra through that section again, it was amazing. It sounded like a new group of musicians had taken over. They sounded so much better. In every way. Being witness to this incredible metamorphosis was the chance of a lifetime. Here was the greatest artist, teaching us how to get the notes off the page and on to our instruments in a more musical way. I always knew that musical instruments were trying to emulate the human voice, but I never took the next step. Now I’ve learned to vocalize what’s on the page and then put it on the guitar. Thank you, Luciano.